I’m back, sorry it has been a while since my last update. During the last 6 weeks i have been up and down from altitude training with the team to prepare for my next big objective which is just around the corner. Since my last blog i have not done many big races it has been quite a calm period of the season. I did however manage to get a 6th place in one of the Italian national races we did. 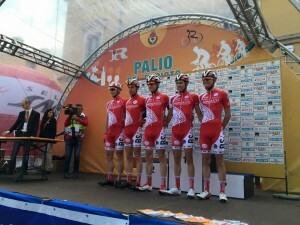 Arriving to the finish in a small group of 15 to sprint for the win against some of Italy’s top amateur and u23 riders. For the other races i have been working to help my teammate partly to build strength and train but mostly to give back for what the others had been doing for me in the early part of the season. So it has been a lot of Kilometres riding on the front and helping guys move up and down the peloton or move them into position for key moments in the race. As for the preparation for the Giro Valle D’Aosta (my next target and main goal for the season) i have been going up to stay in a small apartment of a team mate at the Isola 2000 ski station just a 2 hour drive from the team house. We have been going up on a Monday after races and then coming back for the next races, staying for 5-10 days at a time. Its a small 1 bed apartment, no Wifi, no phone signal and until this week just gone no sign of life!! Only bike riders preparing for up coming races. Its like a ghost town up there empty shops and shut down restaurants with signs saying “re opening December 2016″ its quite spooky at first. That said it is the perfect place to focus and train hard, infact its impossible to train easy because to get back to the house you either have to climb 17km or 25km so it makes for an interesting final hour of training. After 3-4 hours its no big issue you can get up in a reasonable state, But after 4-6 hours then you are looking at some pretty dark moments and plenty of fridge raiding when you fall through the door after “Bonking” with 10km to go. Saying that there is never anything in the apartment to satisfy that immense sugar craving, only pasta, veg or fruit. Maybe you will find a cereal bar or a secret stash of cookies but normally its just a 10 minute wait for pasta to cook which seems to fee like a life time. The training up there has been pretty solid a mixture of 3 day blocks with the odd 4-5 day block to really finish me off. Normally it starts with 2 endurance rides of 4-5 hours and about 3500meters of climbing to build tat base then a combination of 3-4 hour training rides full of specific intervals based on power out put so like 4 x 20 minutes in zone X but in the turns accelerate to simulate a race then other days just 1 minute flat out efforts or even some days where its just the full 20km climb flat out. I am starting to feel the benefits of the work now though so we are headed in the right direction i think. In the last few races i have felt it on the longer climbs too. The last race i rode the front of the peloton on the first 7km climb and we arrived at the top with about 20 guys from a 150 man group (that was a nice feeling) then our team leader attacked over the top and disappeared up the road with 4 guys for the day just to be caught by said group of 20 in the final KM’s with me coming in just behind for 30th place nothing special but after 2 days of ripping it on the front up climbs it wasn’t to bad. 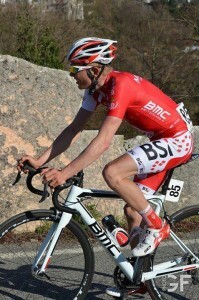 I have just come back down again from altitude today and leave tomorrow for the final race before Giro Valle D’Aosta. The race is tour du pay rhoanias its a 3 days race in the foot of the alps so it should be perfect to test the legs and sharpen up the form. I’m going into it with a bit of fatigue in the legs from the last 12 days at Isola but i have a fresh head and a lot of motivation so it will be a good weekend. P.S. Excuse my deteriorating English my girlfriend pointed it out to me but the only English i have been speaking is with people on the phone or my team mates who aren’t French but on the plus side i speak almost fluent French now!!! With a broad Lancashire accent of course haha. So at the end of my last blog I said I was just about to go to Italy for some international U23 races. The 1st of these was Palio Del Recioto which I can sum up in a few lines. The night before the race three of the five riders on the team came down with a fever (one of them being me). We took the start never the less and after an early break and a day of natural selection I made the front group on the final climb which stretched for 10-15 km. Due to a lack of knowledge and ants in my bib shorts I attacked way too far out on the climb and then blew my legs for the rush of attacks in the last Km of the mountain where the race blew to pieces. I managed to roll in second in the second group on the road to earn me a respectable 28th place from 200 starters and arrive in some good company. 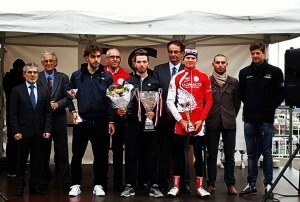 The 2nd race was Trofeo Piva, it was just 4 days later and most of the team had not recovered from the virus that had hit before the previous race. I had managed to come round ok so was up for a good race. After going early the week before I was under strict instructions from our DS to sit in and wait for the selection and go in the last Km’s of the race. On the first lap all hell broke loose with the race splitting into pieces the first time up the climb. I made it into the group of about 40 riders but it all came back together again on the flat. It happened again the second time round but I was still there waiting, then on the technical downhill section a rider just in front of me let the wheel go and a group of 15-20 riders just rolled off the front. With every big team represented it was gone !! The gap held at 1:30-2 minutes the whole race with the peloton being whittled down from 200 to around 15 of the worlds best U23’s. I did try to bridge the gap on a few occasions but with every team having a rider in the break there was no one willing to work, which led to a frustrating race so close yet so far away al day. In the end I sprinted to 3rd in my group just behind the winner of the previous weeks race and again 28th position. (It was a long 5 hours home in the car that day!). After Piva my first objectives of the season were completed and it was time to strip back the training and start building towards the next half of the season. The following 2 weeks there were a couple more races in Italy but while training around them my legs were not tiptop. The 1st of the two was a solid day out, I tried to attack with 15km to go with no luck, it was a flat finish and I managed 30th. The 2nd race was a bit more eventful. It was a big International Elite UCI race with a nice flat windy lap and a small climb to sort it out in the final. After 100km we were just about to start the finishing circuit and a small but strong group just skipped off the front not having done a tap all day. I was fresh and thought I would cover it to be safe. just as I connected with the rear of the group on a small downhill I decided to take a lie down in the exit of a corner, which hurt A LOT! I got back up after being dragged out of the bushes and a ditch, remounted and tried to continue but the pain was too much, I continued for a few Km’s but when the road started to go up I had no power to press on the pedals because my hip had locked up in spasm. Safe to say that put an end to my race. Thanks to the Italian guy who dragged me out of the bushes and pushed me up the hill to my team van. Now I had two weeks without a race so it was time to really step up the training and also a small 3 day visit from my girlfriend. After a lovely 3 days with Charlotte I had my second test of the season in the lab with my team. It was nice to see some big improvements, gaining in power and Vo2 max. That set me up perfectly for a solid week up in the mountains with another team mate. It started off with a rest day for travel and then it was straight into it, 1st day 4 hrs with intervals, day two 5 hrs, day three 6 hrs, day four 2 hrs (recovery), day five 5 hrs 30 and day six 4 hrs 30. All full of intervals and every day to get back home was an 18km mountain climbing 1500 meters. And that brings you up to date. I have just got back to the multi national team house with my Colombian, Estonian, Ukrainian and French team mates (it sounds like a start of a joke I know) who were very happy to see me after some time away as they will now have something cooked other than tuna pasta or tuna rice. Then tomorrow back at it with a small French race to sharpen the legs back up. So After a reasonable open to the season there was one more race left before a small 2 week break to continue building for the bigger races to come. 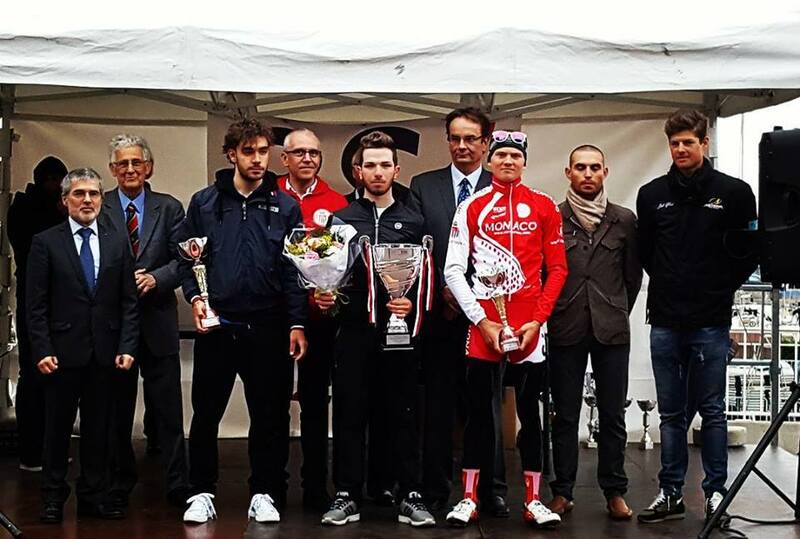 Said race was the Jean Masse memorial race in Marseille, a French national race with all the top French U23 and armature teams racing. It was a fairly lumpy race with a nasty climb on a local circuit at the end of the race. It was a relatively controlled day with everybody waiting for that final circuit which we had to tackle 3 times with 2 climbs of around 2km, one of which finished with 500 metres averaging around 12/13% followed by a very technical downhill. After 100km of racing we made the first accent of the climb where a selection of 30 or so riders was made. After making the decent we arrived for the second time on the foot of the climb and with the breakaway just ahead everyone was eager to jump across and my nerves got the better of me, after following attack after attack we arrived on the breakaway just before the climb ramped up. As the climb kicked up more attacks came!! My legs were full of acid after my early attempts on the climb and I arrived on the top 2 or 3 meters behind the first six riders who then plummeted away on the decent and I found myself leading the chase group of 20 riders. With six riders clear and the majority of the stronger teams represented the race lit up with desperate attacks and some risky descending towards the finish. After my team mate crashed on the final downhill section it was down to me to try and bridge the gap in the last 10km but the chase group was well marshalled and it wasn’t possible to get away. Eventually I arrived somewhere in the first 10 of the chasing group in the dash for the line. Unfortunately I am still unsure of my true result as the officials seem to have missed me off the results. The next few weeks after that were the last few small races before kicking the real season off with all the 1.2 international races. First up was the Nicé critirium which is run just before the arrival of the final stage of Paris Nicé. After going from the gun with a team mate we spent 40 laps of a 1.5 km circuit out front in a 5 man break. After almost lapping the field I gave a massive 1km lead out for my team mate (a fat sprinter) who stormed away in the last 300m to win the race with me rolling over the line in 5th place. A pretty nice day out. Following that was 2 days racing in the foot hills of the Alps. The first was Rohan Alp Sud, a 140km race on the plains before the Alps with a small steep climb every lap just to spice things up a bit. With 60km to go I felt a lull in the small remaining peloton and I hit them on the next false flat going solo for all of about 5km until a small group of riders caught me and we went on to catch the days breakaway. Then it was just flat out to the finish on the big open flat twisty roads. After trying to attack on the final climb, the break was all together for a small sprint where I came 8th from the group of 11. The day after was another race with a similar profile. Unfortunately I spent the day paying for the previous day’s efforts and after making the selection of 20 riders on the final climb we descended down to the plains where the last 15km was rolling roads with some long false flats, I cramped up and ended up riding the last 7km alone to arrive in 24th place. A pretty hard day for the morale but some positive signs for the races to come. After a bit more training and a full head shave (the result of a team bet regarding the team’s first win) it was time for Crit number 2. This time it was on the port of Monaco and the teams home race with all the sponsors looking on. Again it was arranged that we would ride for the team Sprinter (Greg). With the race not going to plan I somehow found myself in the break away! Again!!!!!!! After another 40 laps in a fast moving full gas break of 5 we arrived on the last lap for a sprint. I head-butted my way through to hit the last corner in first and I hit the after burners for the sprint but unfortunately I wasn’t the fastest and with 50m to go 2 riders just past me pushing me into 3rd place. So it has been a pretty successful month with the results getting better and better. I’m hoping I can continue to keep the same sort of results rolling in. I would also like to add a massive thank you to the Fund for their continued support over the years to get me to where I am and step onto my first Podium in Europe! On to the next month with some international U23 races in Italy. P.S. The new bet is after win No.5 we will be a team of red heads !! !